Charting a map of the densest gas clouds in the Milky Way will lead us to the hidden corners of our home galaxy where new stars form. It is not surprising as stars are basically extra-dense clouds of gas that shine with light produced by fusing hydrogen nuclei in their cores. Mapping the locations of the densest clouds is therefore equivalent to finding stars-to-be before their nuclear engines turn on. Creating detailed maps of gas and dust in the Universe is therefore crucial to outlining the environments in which stars and planets form (a vision that kept appearing in the recent 230th AAS meeting). We know quite little about the baby-hood of massive stars – the sites where baby massive stars are born are typically very far away, and they are usually blocked by dust. Moreover, massive stars typically form and evolve into clusters. In order to piece together a meaning picture of their formation, a large-scale map of the gas and dust distributions is called for – a cluster of massive stars may be assembled from gas clouds originally very far apart! Figure 1. A zoomed-in view at the center of the Milky Way Galaxy from the ATLASGAL image release. The red and blue colors correspond to the 0.87 mm sub-millimeter emission and the infrared emission from the NASA Spitzer Space Telescope. The fainter extended red emission is from European Space Agency’s Planck satellite. For an interactive image, click here! 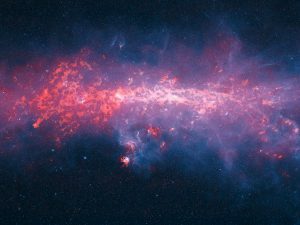 The APEX Telescope Large Area Survey of the Galaxy (ATLASGAL) survey provide a map along the plane of the Milky Way galaxy in sub-millimeter wavelengths with high resolution and large coverage. A zoomed-in view at the Galactic center is shown as the red emission in Figure 1. The 0.87 mm sub-millimeter wavelength lies between infrared light (with shorter wavelengths) and radio waves (with longer wavelengths), which captures the range where the star-making cold gas and dust at temperatures of few tens of degrees emit light. From this Galaxy-wide survey, the authors of today’s paper embarked on a treasure hunt for the cradles of baby massive stars. From the ATLASGAL survey catalog, the authors selected the brightest 219 sources in the sub-millimeter wavelengths (magenta crosses in Figure 2). It’s worth emphasizing that these bright sub-millimeter sources are *not* stars, the bright emission is originated from the cold dust inside the very dense gas on the journey to making stars. After stars are formed, the intense radiation will heat up their surrounding gas and dust, and there will be an associated infrared emission. To identify a sub-sample of sources that exhibits such early hints of star formation, the authors further cross-check the source positions with known infrared sources in the same spatial regions. The presence of infrared emission around a sub-millimeter source suggests that the dust might be heated by the stars formed but still embedded deeply in the gas cloud, and it is said to be infrared-bright. In contrast, a source with no signs of embedded star formation will not give out infrared, and is said to be infrared-quiet. Figure 3 compares the distributions of mass (left panel) and size (right panel) of the sub-millimeter sources. The gray bars represent the distributions of the entire sample, while the red (blue) one corresponds to the infrared-bright (-quiet) subsample. The distributions look pretty normal and similar, and this is exactly the takeaway – the distributions of mass and size are similar between the infrared-bright and -quiet subsamples. The authors further carried out follow-up observations to see if they could detect the SiO molecular emission line from the infrared-quiet sample. The SiO emission line is a tracer for shocked gas (i.e. gas ejected and accelerated by the growing baby stars), which hints at even earlier star formation activity before the baby stars could heat up the surrounding materials to give infrared radiation. 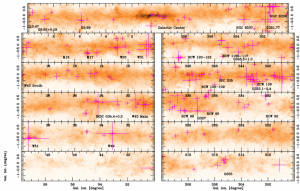 They found that 60% of the infrared-quiet sample shows such signatures of early star formation. So, what do these all mean? The similar mass and size distributions of the infrared-bright and -quiet sources suggest that they share the same evolutionary path. The infrared-quiet sources are simply the precursors of the bright ones, actively gathering mass while displaying strong outflows associated with early star formation. When the assembly of stars inside the gas clumps proceeds, the starlight later heats up the surrounding and the sources transition into the infrared-bright states. These findings are consistent with the picture that gas clumps collapse and fragment before the massive star clusters are in place, suggesting that the build-up of massive clusters require strong, global gravitational collapse pulling many clouds together. This is an important insight for the planning of future observations and computer simulations.